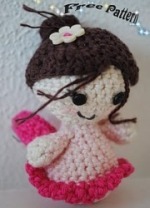 A very sweet little fairy doll, with adorable little wings and tutu skirt. She would make a lovely Christmas angel to hang as a tree ornament. Really sweet....love her...shes sooo cute. Thank you FWD, but the vast majority of these patterns were not created by me!